The Monk Naum of Okhrid, Bulgarian by descent, was one of the disciple of the holy Equal-to-the-Apostles Cyril and Methodios (Comm. 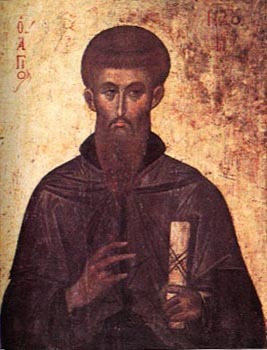 11 May), and he likewise accompanied Saint Kliment (Clement) of Okhrid during the time of his preaching of the Gospel in Bulgaria. When Saint Kliment set off to the south-western regions, the Monk Naum remained in the then capital city of Plisk. Afterwards the Monk Naum became successor to Saint Kliment in a monastery on the shores of Lake Okhrida, where he asceticised for 10 years. The Monk Naum reposed on 23 December 910, and his relics were glorified by numerous miracles, especially healings of sicknesses of soul. The memory of the saint is likewise celebrated on 23 December.